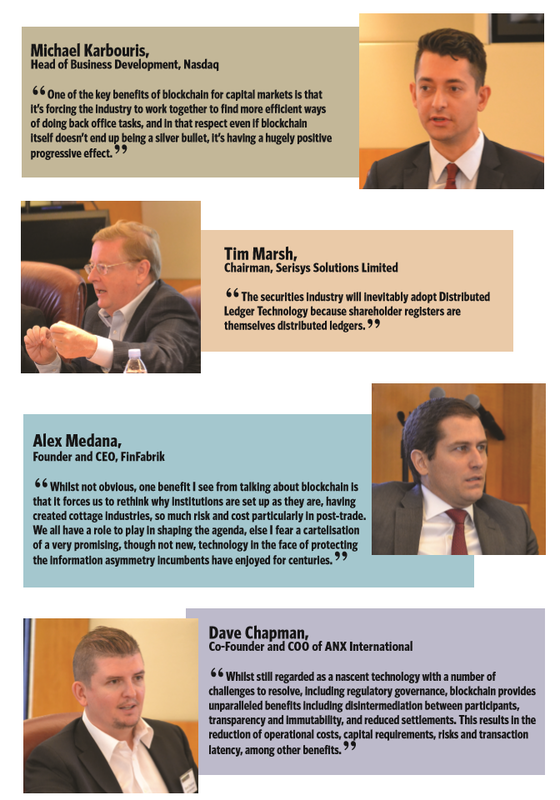 As discussion of blockchain continues to generate media coverage, the securities industry waits for the promised benefits. But the wait might not be long. Like it or not, blockchain technology is associated with its most public iteration, Bitcoin. Yet, the hallmarks of bitcoin’s appeal – transparency, decentralisation – are seen as antithetical to much of the securities world. Successful applications of blockchain technology in the securities industry will likely be a shared ledger rather than a fully public ledger, marrying the immutability and simultaneous auditability, but without the public transparency. 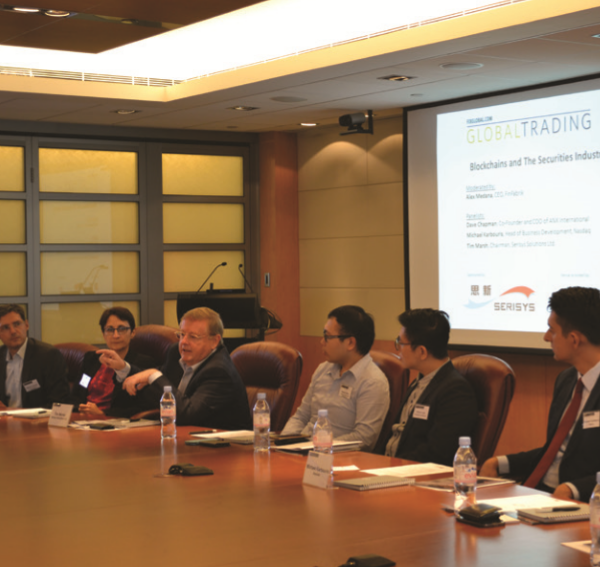 Speaking at a GlobalTrading Blockchain and Securities Industry Roundtable hosted by Citi and sponsored by Serisys, participants agreed that within 10 years, there may be hundreds or thousands of securities industry blockchains, but the real question is which will each firm join? The significance of the answer stems from the enormous cost savings projected to come from distributed ledger technologies, as blockchain is also known, with Banco Santander estimating savings at up to US$20 billion across the securities industry. 2016 has seen a focus on development of proprietary and consortium blockchain applications. While many firms are already involved, participants questioned whether Asia’s heads of trading or their back-office teams know which consortia their companies belong to, or their firm’s strategy for blockchain. Banks have hedged their bets by actively joining multiple consortia, but the major work to be done in applying blockchain to the securities industry is in the adjoining applications rather than the actual blockchain technology. Despite the offer of real-time, shared access to information, it is unclear whether banks will be willing to change all of those adjoining systems. As a result, most banks are currently investing in exploratory use cases. Rather than reframing all back-office processes along the lines of a blockchain, certain participants hope to use blockchain to address existing regulatory costs. When adoption does achieve critical mass around any certain application, one of the likely effects in the securities industry is that securities processing revenues will shrink. Within Asia, a China-specific consortium is looking at blockchain, but the domestic Chinese banks are not discussing it internally. For the Chinese banks, deployment of any blockchain applications will require an official push from the China Banking Regulatory Commission or China Securities Regulatory Commission. Meanwhile, the international Chinese firms are exploring use cases, but many expressed it is unclear what problem desperately needs to be solved by blockchain. Chinese firms are also concerned how much will it cost to realise the purported benefits? A key piece to keeping implementation costs low is standardisation. Already the exploratory work has revealed intriguing questions about blockchain applications. If a blockchain controls an asset, who determines who is allowed to convert into and out of the blockchain? What happens to the cash that is exchanged for the original asset? Peer oversight is needed to ease concerns about decision-making on these matters, and the regulators agree. Regulators know governance is required, as they need to certify the identity of the beneficial owner to conduct proper AML checks, but they are agnostic as to whether governance will come from individual consortia or at a global level. A helpful example of how standardisation can expand the value of a blockchain technology is a KYC blockchain utility, based on certified information. All participants agreed, the overriding, continuing question in the securities industry will always be how to establish trust and with whom.